Huawei Honor View 10 with 8GB RAM officially announced - Playfuldroid! Announced back in December last year, the Huawei Honor View 10 (also known as Honor V10 in China) has been on of the best-selling Honor smartphone so far. 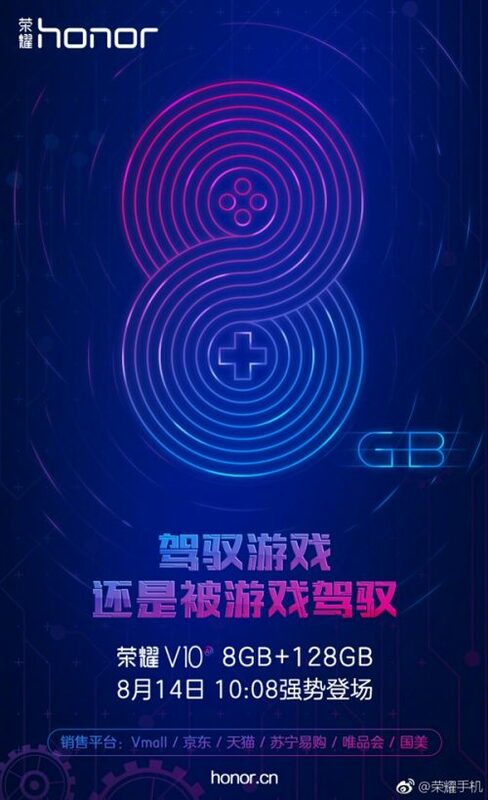 Right now, it seems like the Chinese company is looking to revitalize its sales as they have confirmed that a new 8GB+128GB model will go on sale starting August 14th next week. In case you’d missed out, the Honor View 10 is one of the handful smartphones which are slated to receive an impending GPU Turbo update which will turbocharge the smartphone’s GPU performance and turns it into a gaming beast without any upgrades to the physical hardware. Specs-wise, the Honor View 10 comes with a 5.99-inches LTPS IPS LCD with 1080 x 2160 pixels screen resolution. The device is powered by a Kirin 970 SoC and runs on the EMUI 8 atop Android 8.0 Oreo out of the box. Aside from that, it also features a 16MP+20MP dual-camera setup on its rear chassis, as well as a 13MP front-facing selfie cam. For those who’re interested, the 8GB+128GB Honor View 10 will be available for purchase starting August 14th via most of the online retailing giants including JD.com, Tmall, Sunning, as well as Huawei’s Vmall.